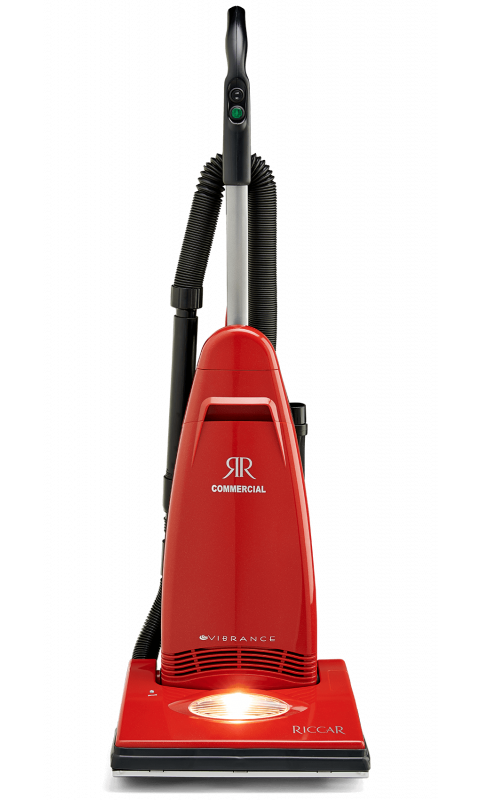 This vacuum not only cleans carpeted and bare floors superbly, but also it features an array of on-board tools that make quick work of cleaning above the floor, whether it's upholstery, baseboards, blinds shelves or ceiling corners. Its Hall sensor shuts off the motor when a jam is detected. Just clear the jam, and get back to vacuuming, without having to change the belt. With metal parts in high-wear areas, the Commercial Vibrance will astound with its value and performance. Tools are stored on-board for easy access. A strong metal roller is designed to perform well and to last for many years. As you'd expect, brushstrips are replaceable and are customizable to your home's floors. Built to withstand the rigors of daily use, Riccar commercial uprights feature metal components, long-lasting rubber wheels and extra-long commercial-grade power cords. A light reminds you when to replace the bag. Breaking a belt is a thing of the past with Hall sensor technology. When it senses a a jammed condition, the brushroll stops until the jam is cleared. Then it's back to vacuuming like nothing ever happened.